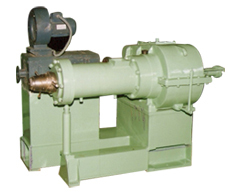 Hot feed screw type extruders are heavy-duty machines built to suit individual needs. They are made in many different type and sizes to meet the production requirements for straining, extruding, tubing, slab production or contoured shapes. The extruders size depends upon the hourly output required and method of feeding and with a complete line of equipment is available to meet with all customers need. Size L/D Ratio. Worm R.P.M. Capacity (app.) K.G./H.R. Electric Motor H.P. Size L/D Ratio. Worm R.P.M. Capacity (app.) K.G./H.R. 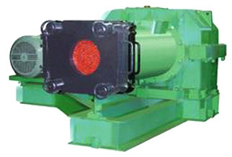 Electric Motor H.P.